"Directories containing directories and files" seems to have been around forever, but there must have been a first. Unix of course also has an hierarchical filesystem, which it seems to have inherited from Multics. 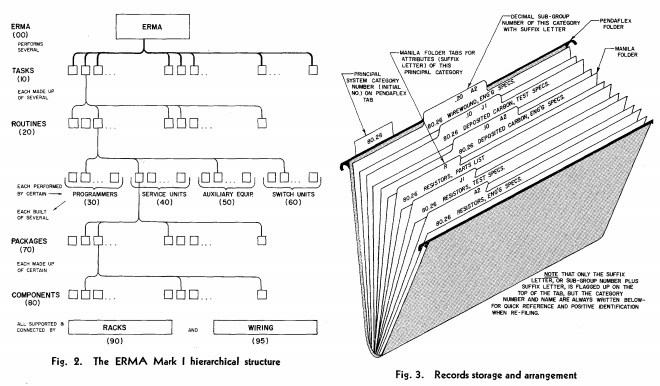 The earliest hierarchical file system with which I had personal experience at the time of its release was ODS-2, introduced with VMS in 1979. Fig. 3 is self-explanatory. It shows the arrangement of the records in the file folders. This file system is "closed" in the sense that it is bounded by the decimally integral coding of categories from 00 to 100 and by an exahustive listing of generic attributes and categories. However, it is expandable in the sense that, when necessary. new entries are permitted within the subcategories and parameters without resorting to modification of the original file structure. For example, categories test equipment-51, external equipment-52, and tools-53, were added later in the only reasonable location; in the 50 series, auxiliary equipment. This method of adding new categories to the file can be likened to the use of the familiar accordian file in which a suitable pocket can be stretched to fit new material, but the structure of the containing folds of the file and its major pockets remain unchanged; This is in contrast to a file of rigid construction in which the only recourse for addition is to append material or to make a new container. I am by no means sure about this information, but wasn't the ICL system for storing on high speed drums (concrete cored) a hierarchical system? This is at about the same time as the ICL CAFS system which (like Don's answer) was first introduced in 1965. The ICL system may fall into the category (described by Don from the Wikipedia article ) as having a fixed number of levels. I don't know where to find the information to resolve whether or not it was truly hierarchical. The ICL system was developed from the LEO range (of several companies that were combined to form ICL) which did not (AFAIK) have any persistent storage - being reliant on mercury delay lines for temporary storage. Who was the first software engineer? Why was the AT&T assembly syntax designed this way? What was the first mechanical Turing-complete machine ever constructed?